US RoofVent is the latest, innovative product from DCI Products. With the major success achieved by the SmartVent over the past fifteen years, we wanted to offer the contractor a rolled version, but with all the same great benefits. If you are a roofer that prefers rolled products, here is your solution for intake and exhaust ventilation. US RoofVent helps eliminate mold and moisture issues and is virtually unnoticeable once installed. Twenty feet per roll, it is lightweight, easy to handle and has the same versatility as our industry standard product SmartVent. BE CAREFUL NOT TO CUT INTO THE RAFTERS! 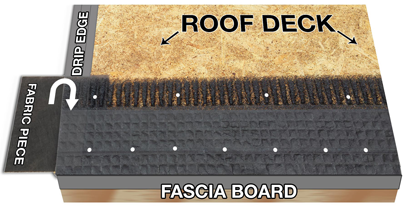 NOTE: Ensure insulation or other obstructions are not blocking the flow of air extending from the soffit to the roof ridge. Ridge vents or other exhaust vents are required. Place the fabric piece half way on the roof rake side edge(Gable) and even along the drip edge. Half of the fabric piece is hanging over the rake side edge(Gable) of the roof. Nail the fabric piece(s) in place with two (2) roofing nails, one high and one low. 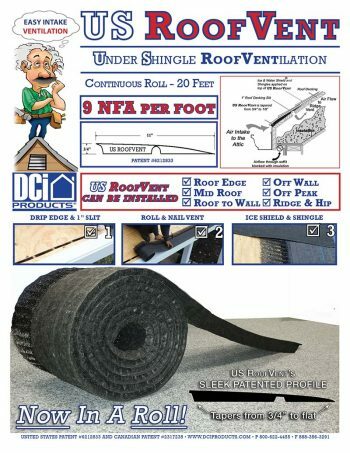 Start the installation of the roll of US RoofVent even at the gable edge drip edge of the roof with fabric edge(aka: lift edge) against the lower fascia drip edge WITH the smoother side of the roof vent facing towards the sky. This will show the nailing line at 2.5” up from the lift edge of the US RoofVent. The rougher side of the roof vent is against the roof deck. 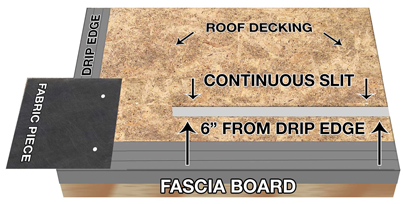 Nail the US RoofVent along the lift edge nail line every 6” – 8” while nailing the no-lift upper edge every 12”. Begin and end within 1.5” of the start and end of each roll. 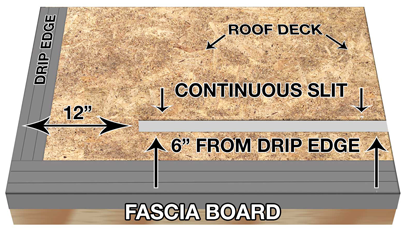 Nails should be a minimum of 1.5” long, enough to penetrate the entire thickness of the wood roof deck. Wrap the remaining end fabric neatly over the roof vent ensuring it is even with the drip edge along the gable rake edge. Refer to STEP 4 for wrapped fabric detail. Nail the fabric with two nails, one high and one low, as shown. Continue installing the roll(s) of U.S. ROOFVENT until the opposite gable edge or to a termination point. Adjoin two rolls together by simply butting them tightly to each other when installing multiple rolls. Use heavy duty household scissors to cut roll length and fabric. Repeat steps 2 & 3 to terminate the run at the opposite gable end. Note: SmartVent Tapered End Caps are available ‘separately’ to slope the vent back down to the roof. This enables the installer to make custom roof vents within the roof shingle surface and terminate the ends of the vent with ease. Use the SmartVent Tapered End Caps on the right side or left side at the roof edge, mid-roof and peak areas. Refer to enclosed details for more information. 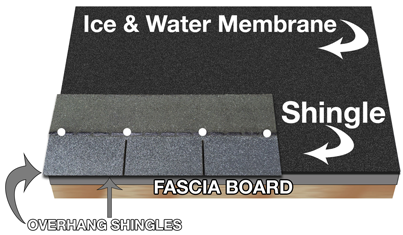 Install ice and water membrane “on top” of the U.S. ROOF VENT. 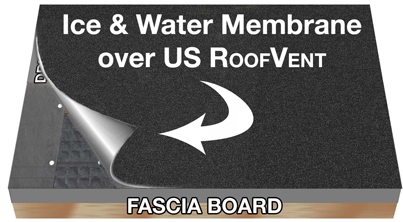 Full width ice and water membrane (36”) is required to be installed over the U.S. ROOF VENT in all environments. Ensure the upper underlayments are lapped over the lower underlayments. Please call the DCI Technical department with any questions. Shingle the roof as usual. Beginning with a starter course, always overhang shingles at least by ½”.You now have proper intake ventilation to the attic. 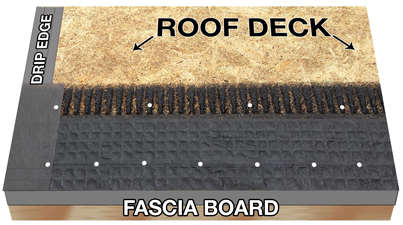 NOTE: Secure starter course shingles to the roof deck at the ¾” lifted edge of the U.S. ROOF VENT with nails that penetrate through the roof sheathing. (Generally 1½” roofing nails are used on new roofs.) Shingles must overhang the U.S. ROOF VENT lifted edge ½” minimum to 1” maximum. Refer to shingle manufacturer application manual. Please call the DCI Technical department with any questions.